Recently Time magazine reported that an ex-franchise manager for McDonald’s sued his former employer for what can be essentially categorised as, making him fat. 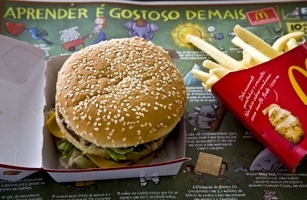 ‘Judge Joao Filho ruled on the lawsuit brought against the company by the 32-year-old former employee on Oct. 26, declaring that McDonald’s should pay $17,500 because the employee ballooned from about 155 lbs. to 231 lbs. while working at the restaurant in southern Brazil. Admittedly the sum is not huge, but is it another timely indication of the litigiously aggressive society in which we all now live? Does it emphasise the ‘compensation culture’ that causes people to turn to blaming others for the accidents etc. that happen in their lives? It would seem that the propensity of people who turn to ‘no win, no fee‘ lawyers makes it very simple for all of us to hold others responsible for our misfortune with no cost burden to ourselves if we fail. Research has shown that the number of personal injury claims filed in the British High Court increased by 32% between 2006 and 2008. The Law Gazette also suggests that this rise could be attributable to an increase in financial hardship.2 I do know that the constant stream of adverts asking me if I have had an accident and want to claim that are shown all throughout the working day, and only watched by those who are not at work, make it seem very easy to get money for something that happened to you. And if you are out of work this could be very tempting. Wikipedia (not always the most reliable source admittedly) defines a ‘compensation culture’ as a society which deems it acceptable for its members who have received a personal injury to seek compensation through litigation from someone connected to the injury, and it can also be used to describe legal culture by those seeking tort reforms (UK).3 Tort reformers are particularly relevant as they are those within the legal world who condemn legal systems that they perceive as representing a compensation culture. They state that compensation culture results in frivolous lawsuits of which many are settled out of court as the cost of defending the claim is much greater than the settlement amount. In response to this public liability insurance is becoming exorbitantly expensive where there is a high risk of compensation. The result of this is that it becomes nearly impossible to host mildly dangerous activities such as children’s sports or other public or community events. Lawyers who take cases on a ‘no win, no fee’ basis are in fact misleading the general public as they advertise their services as a risk-free means of acquiring funds. Whereas, it is possible for the plaintiff to be liable for the defendant’s costs if the action fails so there is in fact a great monetary risk to the individual. It is also difficult to disprove certain types of injuries, such as, neck and back pain and emotional disorders, which serves to increase the likelihood of perjury by plaintiffs claiming such injuries. So is it true that we live in the aforementioned ‘compensation culture’, or do we in fact live in a world where we only sue others when we truly believe that this will cause a service etc. to be improved for the public good? Or is it a bit of both? Then there are others that argue that we have such a negative view of compensation culture that we forget to think that it may be a tool for good and that it can be used to force companies to improve their practices etc. If companies are being unsafe and someone is injured is it not correct to take them to court and force them to change their ways? Or is that just a spin that some put on it to increase their own profits? The appearance and growth of claims management companies. I would also suggest that the recession that we are currently in could also be considered a causal factor for any future increase. The Compensation Act 2006 provides a number of statutory factors designed to reduce the perception that there is a compensation culture at large in the UK. It is the primary legislative and political tool used against this national view that everyone has the right to compensation against somebody in the event of an accident. Analysing the evidence for and against, it seems that there is a commonly held belief that their is a compensation culture in the UK and that our nation’s newspapers complain that we are becoming like the US in our need to litigate first and think later. We are told stories like the one above and are led to believe that we can claim huge sums of money for what appear to be trivial matters. The story above shows that if you eat too much junk food it isn’t your fault and you can sue the person /organisation that gave you the food for making you fat. Such media reports and the advertisements of claims management companies give us the belief that large sums of money are easily accessible to us and that it is our right to be paid when we have been involved in an accident. But, this is ludicrous because if I eat too many Big Macs and put on a stone, well isn’t it my fault for chomping on them in the first place and not going to the gym to burn of the millions of calories that they contain. Or is it McDonald’s fault for selling them to me? I suppose it would be quite funny to go into a McDonald’s and order a Big Mac meal just to have the member of staff serving you going, ‘you do know this will make you fat, and it does look like you could do with losing a few pounds.’ You would go mad and tell them that it was none of their business and that you are off to Burger King where they are not so rude! I personally believe that we do live in a compensation culture and that this culture is potentially dangerous to our society and our understanding of personal accountability. I ‘am’ responsible for my own actions. We can’t all swan around thinking that if something happens to us it will be fine because we will just sue someone for a lot of money. If we are not going to be responsible for our own actions then who is accountable? I don’t think that I can blame my government for the fact that after graduation as I was rushing around handing out my CV to prospective employers in a harassed and worried manner I fell of the edge of a curb and broke my ankle therefore halting my attempt to find employment for a number of weeks? Or can I? Can I claim in court that if the government hadn’t made cuts and those cuts hadn’t resulted in my lack of employment I wouldn’t have had the accident in the first place? I don’t think so. I broke my ankle and it hurt a lot, but I am not going to blame the Government or my local council. I am going to pick myself up, dust myself off and when recovered, try again. I also surmise that we will see an increase in such claims in response to the recession. As the British Government tightens its belt and implements more and more cost cutting measures, clamping down on benefit fraud and the benefits available to the unemployed, the sick and the elderly more people will feel the pinch and will be more likely to make claims for personal injury etc. I wonder if people would even consider faking it in a bad ‘You’ve Been Framed’ manner? Boo it’s gone now I have left a comment. In my native Canada it is more difficult and costly to sue, which tends to dissuade the more frivolous or greedy.